Heesen Yachts has sold a fully custom 70m fast displacement all-aluminium superyacht – it's largest yacht to date. The keel of project YN 17470, as she is currently known, was laid in October 2013, and The Netherlands-based yacht builder announces that it has signed a contract on the new build. Interior design will come from Sinot Design. Sandes Sinot says, 'We are looking forward to a wonderful collaboration. Sinot is working on the interior design with a collection of materials that are luxurious and refined, but at the same time will provide a relaxing environment.' 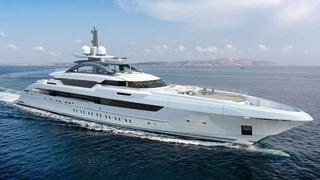 The new 70m Heesen superyacht will accommodate 12 guests in six staterooms. A crew of 16 will be accommodated in eight cabins all with private en suites with showers. An expansive owner's suite, located in the traditional position forward on the main deck, will span 85 square metres and include a dressing room, large en suite bathroom and a study. Guests will be accommodated in four lower deck staterooms and a VIP cabin on the wheelhouse deck, enjoying stunning views from its high perch. Fully LY3 compliant, Heesen Yachts' YN 17470 will feature an oversized infinity pool on the aft main deck, a beach club with spacious swim platform and a port side platform. The elevator in steel and glass will be a notable interior feature, connecting three decks. The tender garage is set forward and will be accessed via gull-wing doors. The helipad will be set forward of the bridge. The sun deck is equally designed for sunbathing and relaxing in the shade – it will be partially covered and be able to be protected from the elements with sliding doors and retractable glass panels. Heesen's YN 17470 will be powered by three main engines driving two wing propellers and a central booster water jet, providing a trial speed predicted to be more than 30 knots. The yacht is due for delivery in Spring 2016. Heesen had announced the sale of its first 40m ‘sportster’ aluminium motor yacht, Project Galatea, already in build, earlier this year in October.